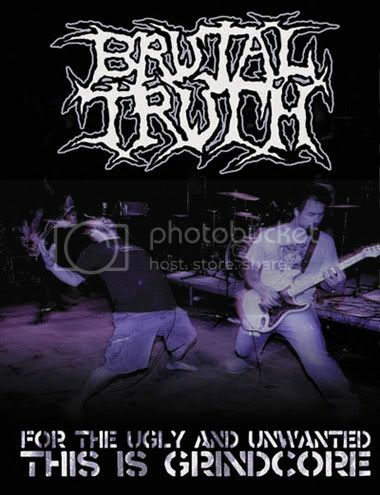 Reunited seminal grindcore/extreme metal outfit BRUTAL TRUTH will relase its first-ever DVD, "For the Ugly and Unwanted - This is Grindcore", in Europe on June 22 via Season of Mist (June 2 in the U.S.). The disc contains a full show shot with five cameras at the Obscene Extreme Festival 2007 in Czech Republic and four more full shows from the "Sounds of the Animal Kindgom" tour as extras. Note that this is only the track listing to the main show of the DVD, since there are four other shows included. "Evolution Through Revolution", the first full-length album in 10 years from BRUTAL TRUTH, sold around 1,000 copies in the United States in its first week of release, according to Nielsen SoundScan. The CD debuted at No. 65 on the Top New Artist Albums (Heatseekers) chart, which lists the best-selling albums by new and developing artists, defined as those who have never appeared in the Top 100 of The Billboard 200. BRUTAL TRUTH bassist Danny Lilker commented: "BRUTAL TRUTH has worked our asses off to write and arrange some of the sickest, most inhuman grindcore ever created. With Jason PC from BLOOD DUSTER handling the mix, we're positive that the music and production on 'Evolution Through Revolution' will satisfy the cravings of the sickest bastards out there." Drummer Richard Hoak added: "I think 'Evolution Through Revolution' is the best BRUTAL TRUTH record by far! We are all totally psyched about the songs and the production and can't wait to start bringing our grinding soundtrack to the end of history live and direct to the people! Hell yeah!"